The plastic skulls themselves will be awesome to set around. Then there’s so much you can do with them. A little hot glue and an old large chair you get a skull throne. 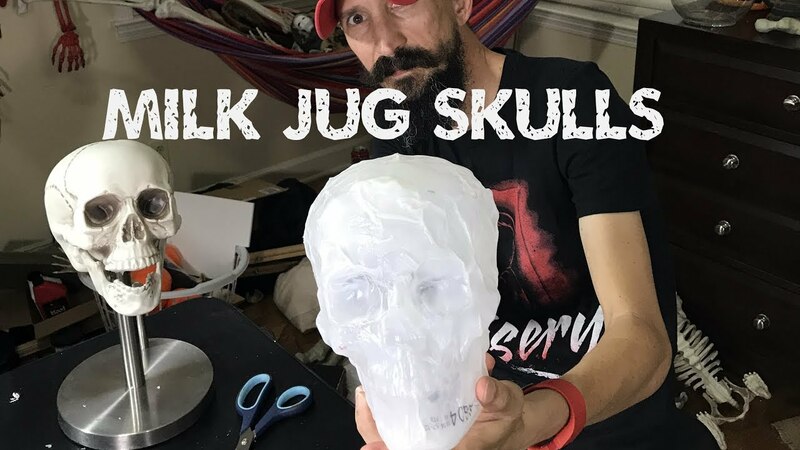 You can probably use the jugs as a mold to make concrete ones or a thin ceramic that’s easily crushed for haunt YouTube/Facebook videos. You could have a clown juggle them. I mean that’s creepy. Make them in the off season to sell as anatomy dummies. To me the ideas are endless. I hope this helps someone’s haunt and creeps out your guests. I’m gathering supplies to do it. I’m probably gonna borrow a heat gun from a coworker who does leather work. I’m currently trying to find a good model skull. Probably just gonna pick one up in the Halloween section of the stores. It all seems simple and straightforward on making them. I also got side tracked flipping a unicycle I bought. Haha I’m doing it black light colors with a white wall tire and some outrageous looking pedals. Can't wait to see what you come up with. I'm doing something to our haunt 'The Darkness' next year called SKULL KINGDOM! Like the Reign of Kong ride at Islands of Adventure in Orlando?